If you’re like me, the Psalms is your default book in Scripture. When I wake up in a funk and can’t focus on whatever I had been studying in Scripture, I turn to the Psalms. When I am troubled or sad, I turn to the Psalms. When I feel overwhelmed by my life, I turn to the Psalms. When you and I do this, we are joining God’s people throughout history. What do we look for when we turn there in trouble? We flit from Psalm to Psalm until we light on one that seems to express our feelings. Then we dive into it headfirst. We hear our voice in its voice. Its words not only give us the vocabulary to label our unruly emotions, they also carry our feelings into the very presence of God. Our struggle is named by God. We know that he sees us and knows us right here, right now. Further still, we are given words to speak back to him. So we find ourselves praying the Psalm. Because we are using words he has supplied, we cry out in confidence that he hears. The Psalms help us connect our faith to our feelings before God. Our intuitive use of the Psalms is great. But there’s even more that God wants to give us in the Psalms. They don’t just speak with one voice–our own–but with three. This way of interpreting the Psalms has a rich history in the church, dating back to the church fathers. It will turn our instinctive snacking on the Psalms into a three course feast. What are the three voices of the Psalms? First, there is the voice of the original author. For almost half the Psalms, this author is named as David. Other Psalms are identified as written for worship by Asaph, the sons of Korah, or even Moses. 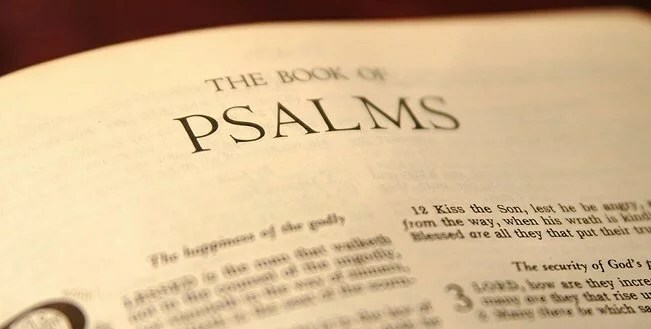 Some of the Psalms are not credited to a human author. But all of them were written by someone who took the raw materials of his circumstances, sifted it through his inner life before God and transformed it into poetry. When you read the Psalms the first time, hear the voice of the human author by knowing the background and understanding the structure and words of the Psalm. 2. The second voice we hear is the voice of Christ. What do I mean by that? In his earthly life Jesus was a “good Jewish boy.” He memorized and recited the Psalms in worship just like the other boys of his day. Of course he went beyond the average use of the Psalms to use them perfectly. In obedience to Deuteronomy 8:6 he didn’t just live by bread alone, but “by every word that proceeds from the mouth of God.” He lived on the Scriptures. He fed on the Psalms for faith and quoted the Psalms for comfort. When he cried,”my God, my God, why have you forsaken me?” from the cross, he wasn’t just quoting a memory verse or even fulfilling prophecy, he was pouring out his soul before God. When you read the Psalm the second time, read it as if Jesus were speaking it at some point in his earthly life. Try to imagine a time in his life when he might have chosen this Psalm to express his heart to the Father. 3. The third voice we hear is our own. Allowing that David and his kingdom are types of Christ and his church, we can additionally read the Psalms as the voice of Christ and his church to the Father, and as the words of the church to their Lord and Savior, Jesus Christ. This is so because Christ is as fully human as his father David…but he is also fully God. I’m hungry to see Jesus in the Psalms. Let’s learn to do that together. Found In Him Chapter 10: Where Am I Living? I am so thankful you posted this and I found it. looking forward to feast on the psalms and finding christ. thank you rhondi! Welcome back to the blog Natalie! I’m so glad we’ll get to stay in touch through it this year. Hope all is well with you and your family. I am in… I will do my best. I printed out the reading schedule. Very excited about it. Thanks Rondi. this sounds very exciting! i really got excited reading your point #2, thinking of Jesus learning the psalms as a boy and leaning on them, feasting on them, living them…. =) looking forward to feasting …… thanks Rondi! You’re welcome, Cheryl. Good to have you joining us again! Hi Vicki! Good to see your name again. Wish I could see you face to face and give you a hug. Hope you enjoy the study, friend. I have no idea how I came across this study but am glad to have found it. Looking forward to learning, growing, and feasting on the psalms. Thank you for this study! Welcome Maria! God must have brought you. I’m so glad you’re here.